Anyone that follows Community Matters knows that I am a Wegmans fan but after my experience yesterday, I may find myself shopping at the Acme in Paoli more often. Around 3 PM on Wednesday, as I left Acme there was a large organized group of men in the parking lot changing into identical white t-shirts, many with signs and American flags. As I got closer, I could see several pick-up trucks with signage with anti-Warren Kampf messages – ‘Working Families Against Kampf’, ‘Kampf Works Against Workers’, etc. Clueless as to whom these people were and what they were doing, I asked and was told that they were members of Pennsylvania’s Carpenter’s Union and they were ‘taking their message’ to State Rep Warren Kampf’s office in Paoli. I was far from clear on exactly what the union members ‘message’ was, but … frankly, I had the distinct impression that these people had a mission and that they were not particularly interested in engaging in conversation. It is not everyday that there is a long line of union picketers walking along Lancaster Avenue, and I decided that if I followed them, that I would eventually figure it out. By the time the large group of 85-100 arrived at the door to Warren Kampf’s office,Lancaster Avenue and Darby Road was filled with honking motorists showing their support. Slowly circling the Paoli streets, each of the accompanying pick-up trucks had amplifiers loudly broadcasting pro-union, anti-Kampf commentary. 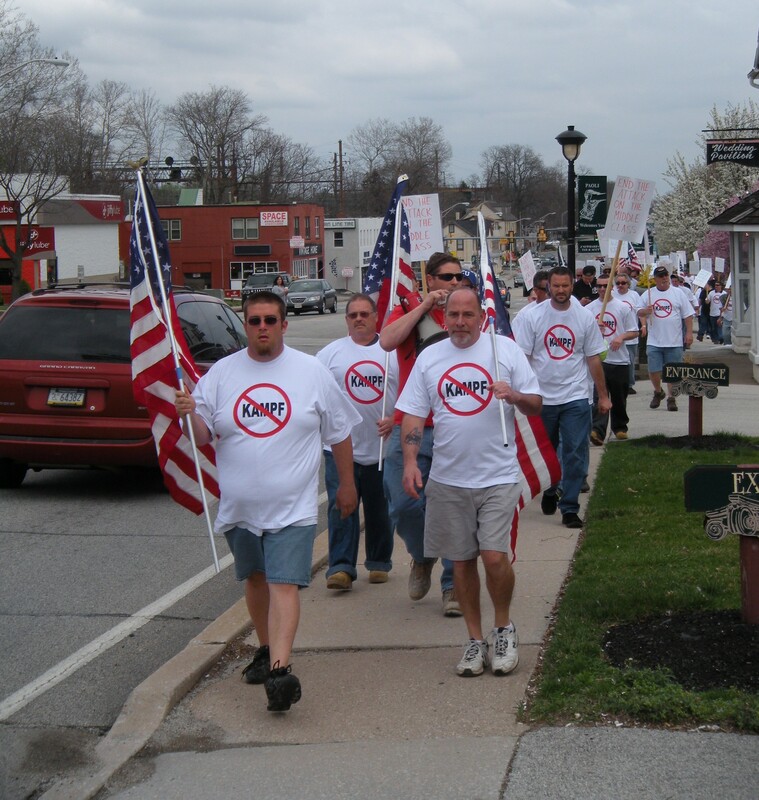 OK, I finally figured out the mission of these union representatives and the purpose of their afternoon rally in Paoli — PA House Bill 709. Rep Kampf sponsored HB 709, which eliminates school districts from the coverage of the Prevailing Wage Act. The passage of the bill would allow an individual school district to vote to pay its contractors a prevailing wage if a school board wishes to do so. “Forcing them [school districts] to pay an inflated rate for public contracts is both fiscally unwise and burdensome to taxpayers, particularly to those on fixed incomes who face annual increases in property taxes. Prevailing wage rules require public agencies to pay contractors a wage set by bureaucrats, which usually equals the local union rate. In some cases, that inflates wages well above what that contractor’s work is worth in a particular location. Although tabled last fall, according to the PA State House calendar, the proposed HB 709 legislation is coming off the table and is scheduled for discussion by state legislators on Monday, March 26. Understanding the financial crisis that school districts across the state are now in, it is certainly plausible that the proposed HB 709 legislation that could help by saving district’s money. On the other hand, is there a risk that this prevailing wage reform bill could result in work performed by undertrained, non-union contractors that could potentially result in higher long-term costs to the school districts? The opposing views on this issue do not appear to be as simple as a ‘pro versus anti-union’ argument. From what I surmised by the picketing Carpenter Union workers, they are of the mind that changing the prevailing wages laws does nothing more than increase the challenge and burden for union workers and their families. But how does that argument weigh against the possible savings to school districts (taxpayers) … and could one additionally argue that prevailing wage reform could create more jobs because school districts would be able to stretch their money further and spend money on more projects would have gone to wages? I can see both sides of this argument – possible cost-savings to school districts in an economic climate of great need versus the hardship that could be placed on union workers and their families in a time when jobs are difficult to find. 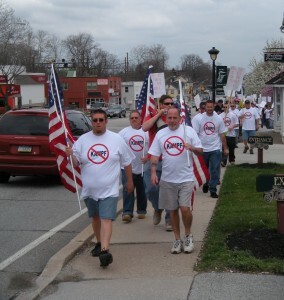 For a 45 second YouTube video, click here – Carpenter’s Union Protest in Paoli . Click here to read PA House Bill 709. I am amazed that Rep. Kampf holds his own public forum on pension reform and attends the next day’s TESD forum on the same and you write nothing, then a few union people show up in a political stunt and an entire article. 1 – This legislation was introduced a year ago. Apparently either the union’s just found out (highly unlikely) or this is just a political stunt – absolutely. 2 – So the union’s don’t like that Rep. Kampf is trying to give school districts an option (not a mandate) to save taxpayers some money…they want us to continue to be forced to pay more. 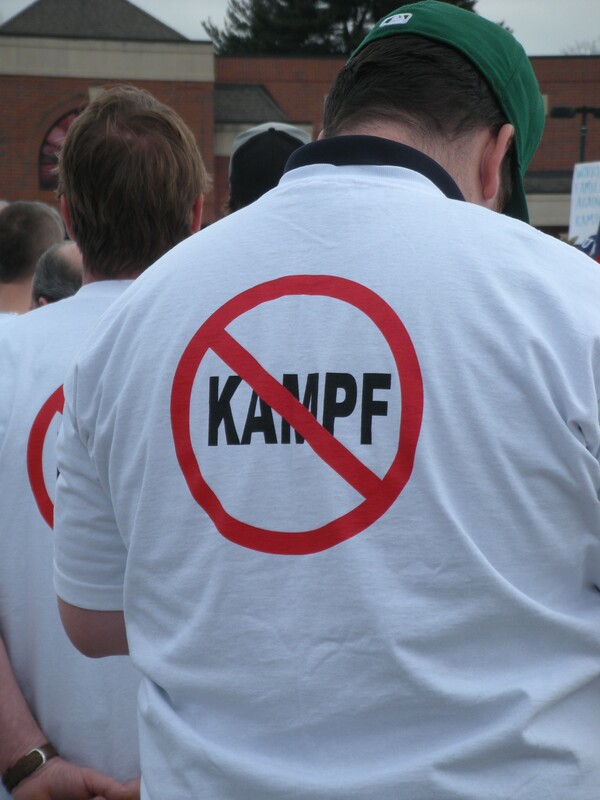 I stand with Kampf on this on, as do most school boards and taxpayers. 3 – This “protest” comes on the heels of the special interest unions sending a negative mailer into our community to support their ally, Paul Drucker. It’s pretty clear the unions are fully behind Paul Drucker again and will use any tactic and spend whatever it takes to have him back in Harrisburg voting for their special interest concerns. Get ready for a negative barn burner. And get ready for Paul Drucker to spend another $700,000!! 4. Where are these people from? I bet you it isn’t from the 157th (at least not all of them). Again: people who want more of your tax dollars for their own interests. This year is becoming clear: special interests who just want to keep bilking taxpayers support Drucker. They oppose pension reform, fiscal responsibility, mandate relief, etc. that will get us back on track as a state…and so does he. Actually, I ATTENDED Sunday’s pension reform town hall meeting. And as an FYI, I am writing an article on the town hall meeting but was WAITING until I received the full set of slides to include in the post, which I have now received from his office. As for yesterday’s protest rally, I would guess that the union has been following the proposed legislation. As I said in the post although introduced early 2011, it was tabled last fall. Obviously, the union was following HB 709 and saw that it is now off the table and on next week’s agenda. House Bill 1523 (the gun control bill) was tabled a couple of weeks ago but there is another similar bill that is on the Senate agenda for Monday. Back to CM — obviously what is of interest to me may be of no interest to others. I appreciate that — I was fascinated by the protesters yesterday. But I then took the time to research HB 709 so that I could better understand the position of the union members. Maybe everyone else knew about the proposed prevailing wage legislation — I know I read Warren’s summer newsletter but had forgotten about it. After researching the bill, I tried to be clear that at this time, I don’t have a strong position, one way or the other. There are only so many hours in the day and between my own business, volunteer board commitments and meetings, CM is about what interests me. One last thing — although I attend many township and school board meetings, I obviously cannot attend them all – nor do I have the time to write posts on every meeting that I attend. Anytime that you (or any other readers) attend a meeting and would write a summary/analysis, send it to me and I will gladly post it to CM — just as I have in the past with school board notes from Ray Clarke. Follow-up to my offer to post summary/analysis by readers of meetings attended on Community Matters — Although I welcome submissions to CM, they will not be posted anonymously as is the case of comments. Since you were at Kampf’s town hall meeting, perhaps you would like to write a summary for CM. when do the taxpayers picket union hall? or should they have been doing that by now. self interest vs the greater good. Look for Al Sharpton and Jesse jackson to arrive soon. One point of clarification – Prevailing Wage does NOT mandate that union contractors be hired. If a non-union contractor bids for the project and pays his workers the prevailing wage, that non-union contractor can still get the job. 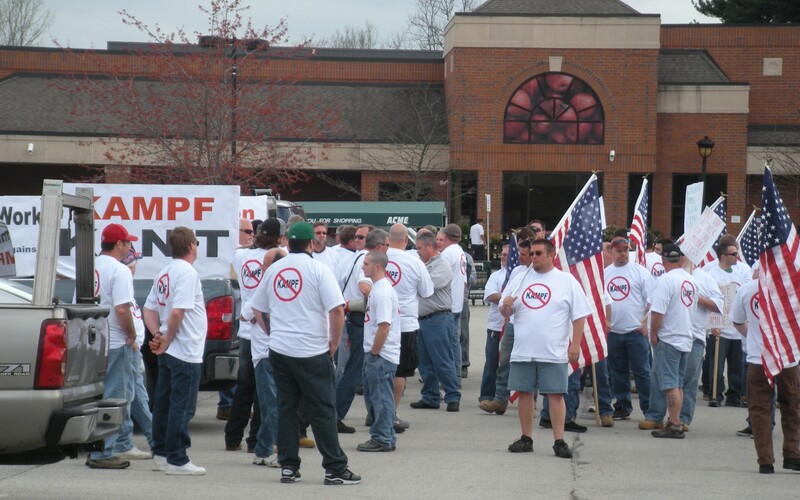 So these union members were out protesting to keep good wages for themselves AND their non-union competitors. Prevailing wage laws are just a way of limiting competition and increasing labor cost with no additional benefit. The idea that “untrained” workers would get the jobs in just silly. Prevailing wage laws may have made sense when they were adopted 80 years ago, the economy and society have changed considerably since then. How many people insist on paying union wages when they work done at home such as remodeling, landscaping or cleaning services? Really. Exactly, LWR. The prevailing wage is a way to protect the unions from competition – taxpayers end up footing the bill for the higher labor costs. I absolutely agree with Mr. Kampf’s position on this. Well Said Adam….problem is that the protester is out to keep wages good — in this case “artifically high” would be a more accurate term. I support Warren in this. I only wish he would have included municipalities as well in the proposed legislation. Taxpayers would win in both situations. I think there is other legislation to do that am pretty sure if you ask him you will find Rep Kampf supports it, too. I was also at Acme yesterday and saw this protest. Unions, in general, don’t give major money to state house candidates. All the big money, including the bulk of Drucker’s last campaign, comes from the House Dem Campaign Comm. Drucker won’t be getting that money this time because they do not support him. Those protestors do not represent the people of Tredyffrin. Their protest helps Mr. Kampf, IMO. Sorry, but the unions fund the dem house committee and the PSEA in particular funded all the Main Street Values PAC or whatever it was called that paid for so much of the negative mail to help Drucker in the 2010 campaign. Whether they give right to drucker or to the other groups paying for his negative campaigns, the unions paid. well they don’t represent Tredyffrin and a majority of them aren’t from here I would bet. But it would make sense that the workers would be from all over. And the thugs come here, spray their territory and make fools of themselves. Enough said. WOnder why they are protesting and not working. There are two sides to this issue. On its face, all can agree that schools and municipalities are in financial distress, and that lowering the cost of construction projects will allow more work to be completed. The research on prevailing wage laws and construction costs indicates that any potential cost savings of paying lower wages and benefits are eaten by lost productivity or by higher profits or salaries for construction owners and top managers. In an economy with a shortage of middle-class jobs, it doesn’t make sense to jeopardize family-supporting construction jobs, especially when there’s no public benefit in the form of cost savings. The mailer’s sponsor, Keystone Progress, sent that mailer without any communication with the Drucker campaign. It is a progressive advocacy organization that focuses on issues of state or local concern. It does not advocate for particular candidates. Absolutely not. Mr. Kampf’s bill is one of at least seven related bills proposed over the last year by House Republicans. Unions are well aware of the onslaught and well organized to oppose them. HB 709 appears on the list of tabled bills. It can be activated and voted on at any time. Clear to whom? Reasonable people on both sides of the aisle support all of these things. They have different ideas about how to accomplish them. The Keystone Research Center is a union front and its data biased and unreliable. The board of directors for the Keystone Research Center is an alphabet soup of union representatives – AFL-CIO, Steelworkers, AFSCME, SEIU, and so on. To quote this organization’s research as authoratative, without revealings its background, is a joke, and indicative of the union operatives who would advance their own interests at the expense of the public. Warren is doing a great job, and this bill will prompt more support for his reelection campaign. It’s wonderful to see one man stand up to the Carpenter’s Union “White Shirts.” Thank you Warren. I didn’t say drucker knew about the mailer, I said it was his special interest allies working to help him. And it was, the same as this foolish, Philly-style union stunt. The FACT is that Keystone Progress is a political action committee (not an issues group) and it is funded by the SEIU (union opposed to prev wage and pension reform), other unions (same) and trial lawyers. All of these groups poured more than a million dollars into supporting Paul drucker and are at it again. Claiming Keystone Progress as some thoughtful, nonpartisan group is like claiming the RNC or DNC as the same. Face it, the unions want Drucker because he voted with them in the policies that are bankrupting taxpayers before and will do it again. cake, after reading the problems without prevailing wage as it relates to workers i had to wonder about the slant on the keystone group without knowing much about it. Some of it just seems illogical. Who sets the prevailing wage, anyway? With which of these two are you affiliated so that you can make this kind of declarative statement? KP or PD? Otherwise, isn’t that just conjecture? TR — I will answer this comment. The Drucker campaign issued a statement (I saw it on the Phoenixville Patch) which stated that their campaign knew nothing of the mailer nor had their been any communication with Keystone Progress — the statement was very clear that the mailer was not sanctioned by the Drucker campaign. I don’t know where the statement appeared but it certainly was on the Phoenixville Patch. To Kate and her Cake — and those on the “other side” : This is why peoplel should not register by party. They should just be baptized. Those on the “right” agree with the legislation, but in comes someone who is dependably on the “left” with data to support the other side. This is why partisanship is so dangerous. Does anyone think for themselves — or do we just take the opposing view? When you want to paint or remodel your house, you go get bids. You are allowed to choose whatever bidder you want. Well — in schools, you go get bids — they all must be bid at the “prevailing wage” (i.e. union rate) and then the district must select the “lowest responsible bidder.” Prevailing wage is a way to guarantee unions would be competitive. Absent the prevailing wage law, hiring non-union would almost be guaranteed. And in Pennsylvania, that results in major backlash. Didn’t we have this conversation before the last election when the “thugs” or whoever was involved in some event in King of Prussia? When you have your home renovated, private citizens rarely would go to a union contractor — simply TOO expensive. So we can look at all the research about the benefits of prevailing wage, but the reality is that unions are strong — unions are VERY difficult to join (ask an electrician about what it takes to be “invited” into IBEW 98). And FTW is right — get ready for mailers filling your mailbox condemning Warren Kampf. 709 takes on the unions, and his pension reform efforts take on PSEA — the biggest union in the state. So — pro union or anti- union really isn’t the issue. Choice. Pro Choice. This bill gives it to school districts. Agreed. I can go online and find a group “on the right” with a non political sounding name that proves prevailing wage increases costs by 30% or Moreno taxpayer funded projects. It is about common sense, fiscal discipline and giving consumers some choice. The funny thing is that the legislation doesn’t mandate an end to prev wage,it lets school districts opt out. The fact is though that many will opt out and the unions know it,which sort of proves why this is a good bill. The Keystone Research Center is just a union mounthpiece. Just look at their Board of Directors. Prevailing wages exist for a reason – to prevent strict competitive bidding requirements from destabilizing regional construction markets. When wages are set for public sector contracts, the focus shifts to work quality, productivity, and efficiency – without touching off a “race to the bottom” as contractors underbid one another by lowering the pay rate earned by their workers. The vast majority of construction workers are not union members and no one is looking out for them. Prevailing wage laws protect these workers. Rep. Kampf’s bill and other related bills propose to lower construction costs for school districts and government bodies at the expense of decent paying jobs for skilled workers. Who deserves to earn a decent living? With the repeal of prevailing wage laws, manager/owners will prevail over skilled workers. The latter will compete with less experienced (but cheaper) workers for lower wages while increased profits are enjoyed by those at the top. Another outcome: skilled workers will leave the state in search of higher paying jobs. Isn’t it ironic that some legislators (public sector workers paid with tax dollars) make sure their own compensation, health benefits and pensions are protected……while they propose pulling the rug out from under those who do work for the public sector? All while insisting they are saving taxpayer dollars. I understand what you are saying, and I even wish I agreed. It’s an honorable concept. The fact is — the world is flat. So is Pennsylvania. We don’t manufacture in this country because we lose those jobs to people who do it cheaper. Prevailing wage laws artifically prop up wages. The demand for labor is met by cheaper alternatives. Yes — “non union” people make union wages in public sector jobs. But as long as the tax base is NOT in the same situation — artifically overpaid — it’s simply no longer a workable solution to prop up some wages at the expense of others. And that’s what prevailing wage laws do. That’s why there is this cry of “Socialism” associated with the views on the left….because people who cannot turn to someone to help them get back what they lost are mad that the government is providing services to people who maybe never worked as hard as they do. It is definitely about protecting their own. And I agree — legislators have to take the first bite. And I think it’s fair to repeat that regardless of the reason, Warren Kampf does not take a government pension, so his going after the pension system is not hypocritcal . And trying to reduce the costs of school district projects does serve his constitutents in OUR school community. A few years ago, when the middle schools were renovated, the state had a temporary option of “mandate” relief, where you could apply for freedom from mandates in school projects. TESD applied for and received a mandate relief for those projects that allowed the district to bid the JOB, not bid each prime contract. (There is a mandate that you have to bid each component of a job separately — electrical, mechanical, plumbing, and general construction). Anyway — it was staggering how much more smoothly it went having a general contractor run a project than having internal controls having to work with individual contractors who pointed figures at each other about who was slowing who up. Ironically, it was a one time opportunity, because there were groups (unions and others) who opposed the idea. SO — government ends up with lots of loose ends like prevailing wage that protect someone, but not everyone. It’s lobbying, and I think in this foundering economy, someone has to protect the average family — who pay taxes. Catch 22? Yup. But for local residents, not as much. We don’t manufacture in this country because we lose to people who do it cheaper. Do you think prevailing wages will HELP that situation? All kinds of barriers are put up in front of our workers, (see Boeing in South carolina) . Setting artificial wages, higher or lower does not work..(Nixon in the 70’s). Bringing manufacturers back to the US is multifaceted. Tax policy, regulation, prevailing wages, union vs non union.. lawyers advertising on TV to incite law suits…And on top of the cheap labor abroad, is there any reason why someone would want to do business here in the current climate..? So you have a health czar determining what procedures I can have, you have a prevailing wage czar who decides what labor is going to cost, you have someone telling me what kind of toilet paper to use, light bulb, blah and blah.. It is just too much.. I am interested in your thought” someone has to protect the average family”..Why? from whom? corporations? Union bosses? How about that average family whose breadwinner isn’t in a union and he is deprived of working a site because of that. Oh, so he has to join the union. Why? kinda like the mafia.. This is wider than the narrow scope you suggest. FF Long-winded as my response was, it would be good if you read it all and not just a line or two. I never said prevailing wages would help — used that as an example. Everyone, engineers, teachers, nurses, clerks, accountants, bus drivers, policemen, landscapers can all get their wages set by an agency in Harrisburg. And let’s follow the example set by the prevailing wage act and set everyone’s wage 20% to 30% higher than competitive rates. Everyone agree? KK, exactly right. lets have centralized control, like the Soviet block. We are going in that direction in so many ways. Hopefully the middle America folks are seeing the light. Free markets? Not even close. Thuggery, intimidation. Protecting ones entitlement…Getting closer to utopia. Good point. Although I don’t know how the government agency would determine what rates to use, if everyone were to be part of the scheme. The term “competitive rates” has no meaning except in the context of a free marketplace. Econ 101 . . . . . I am sure you mean Senator Dinniman, right? After all, he gets three taxpayer-paid pensions, takes the perks and per diems, etc. But, you can’t mean him because he hasn’t supported these reforms. Maybe you mean Mr. Drucker – oh, can’t be that b/c he took the pension AND opposed these types of changes and is supported by the special interests who oppose it as well. And I know you can’t mean Rep. Kampf because (like he promised) he didn’t sign up for the pension, or the per diems, or the car, etc., etc. – so he is actually “walking the walk” on the issues he is trying to change. Can you explain who you mean? Or was this just a partisan, class warfare attack? I appreciate everyone’s comments. Yes, most families are hurting, or at least still recovering from the staggering hit everyone took in the 2008-9 recession. Why protect some families at the expense of others? That is an important question. Most of us could use a break. I’m not promoting government control of all wages, but there’s good reason to assure quality and safety on public projects by using approved contractors – union and non-union. (BTW, non-union construction workers make up 86% of all construction workers, FF.) Also, labor costs, according to construction Industry experts, are generally ONLY 19% to 24% of the total cost of a construction project. How much in savings are we really talking about if less qualified workers do inferior work that needs to be fixed, and they take longer to complete projects? Also, do you know that not even one of the House or Senate legislative proposals even mentions the idea of passing the results of any local wage cuts on to the taxpayers who are footing the bill? I believe both workers and taxpayers are likely to get screwed with the proposed prevailing wage reform bills. Obviously there are two sides to this issue and I think a number of good points have been raised. But Patty I have to ask if you have considered limiting the times an individual can comment on any given post. Looking at these 32 comments, 7 (or roughly 22%) are attributed to FTW. Doesn’t seem to matter who makes a comment (including you) he or she has to respond. If this person isn’t on Kampf’s payroll, he should hire him or her. I like the sharing of information on this forum but find the partisan bickering tiresome. The hard-sell partisan approach is not going to help either candidate win my vote. Just my 2 cents and thanks for doing this for the community. Thanks for your comment. One of major reasons that CM exists is because I believe that everyone’s ‘voice matters’ — as a result, there is no limit imposed on individual comments. Sorry if you think I post too much. However, if you look at most of my posts they try to take the partisan stuff out of it (particularly in the case of the voter ID bill debate) and, in fact, have asked others to stop the same. I do stand up to defend Rep. Kampf and his legislation in this case b/c I am passionately on his side on this issue. The idea that if you are not union means that you “may” be undertrained is a load of garbage! The Unions have had strangle holds on many industries and wallets of not only school districts but also avg. citizens! I have had plenty of work done by unionized plummers, electricians etc. where the work was shoddy at best! I have been confromted with unionized workers in convention centers where you you were forced to have one union member plug in al electric cord, someone else lay down the carpet and someone else hammer in a nail, all at exhobitant rates! Is it a wonder why the philly convention center is still struggling to pull in the top conventions? We need a right to work law here in PA and everywhere else. Remember that the $$ you pay for union work is also going to pay dues that are being funneledas contibutions to obama’s campaign. Please also remember that many “union” workers do not necessarily want to be part of the union but are forced to if they want to get a job in their unionized field or be ostracized or worse! interesting. folks really don’t seem to be that into evidence here. here’s the thing though the evidence overwhelmingly shows that prevailing wage regulations in a low bidder environment do not increase construction costs and in even a few cases tend to lower them (if you want to see what happens when you eliminate prevailing wages in a low bid environment just google “palo alto gilory library cost prevailing wage” and see for yourselves. i keep seeing over and over again appeals to “common sense” that are anything but. for the “conservatives” here, you seem to forget the part about maintaining (or conserving) institutions and practices that work. instead the way i’m seeing it used is as some weird shibboleth that’s more about hating libs and union members. weird. Pingback: » Two Bills Take Aim at Pennsylvania Prevailing Wage. Construction Trades Fight Back.